Dodo- no rare birdies this week, please! Quite frankly, last week was pants. We didn’t really stand a chance as early as mid second-round and the frustration was increased with the win of last week’s 80-1 selection Jaco Ahlers gagging up at the Dimension Data just seven days later. Breathe. This week the European tour takes the short hop from Oman to Qatar and they may as well take the leaderboard with them as criteria for winner-finding looks very similar indeed. You’ll read full previews that suggest as much so just a quick mention that similar windy and/or links apply this week as they did before Oman but perhaps these are much more solid, being proven in top company. KLM, Gleneagles/Wentworth, Valderamma, Scottish Opens, Turkey, Sweden and Morocco all appear in formlines of contenders of the past, whilst Farncourt and the Nedbank in South Africa, and the Portugese courses of recent years are all extremely relevant to this event. Last year’s winner Wang also won the Trophee Hassan, ran up in the Nedbank and won in windy Mauritius, whilst back-to-back victor Branden Grace is one of the most confirmed Links players of his generation. Travel back to Chris Wood (bounced back from nowhere to contend in 2nd last week), Paul Lawrie and Thomas Bjorn and the pattern is clear. The issue will be finding value amongst the books. In the absence of Grace, who would surely have been value even at 10-1 in this field, the Springboks have some lively reserves including the hugely promising Erik Van Rooyen and Haydn Porteous. Whichever one of those eventually turns out to be the future South African number one is unclear but the former appeals as ready to strike form very soon. Having played well in China and Oman on the Challenge Tour last year, he has been playing well at home, finishing strongly at both Joburg and at the Dimension Data at relevant Fancourt last weekend. At 66-1 in a couple of places this huge driver is worth considering in the smaller markets but I’m not sure he has the experience to think it through when needed on course debut, and although less than half his price, compatriot George Coetzee holds more convincing claims by far. ‘Big’ George doesn’t really need much more to convince if taking into account his best form. Ignore the missed-cut last year and he carries course form of 7/12/5/2/35, whilst his best results of a poor 2016 and 2017 included top-10s in Portugal, the KLM, Nordea and Turkey. Last week’s fast-finishing 13th at Fancourt came courtesy of an opening 78 and showed again that he enjoys turning up at the same venues each time (numerous top finishes at the same event). There seems no reason why he can’t prove the best of the top lot and is a quite confident selection from the top of the pile. As a big fan of Edoardo Molinari, it was nice to see him return to form with a 16th last week in Oman. 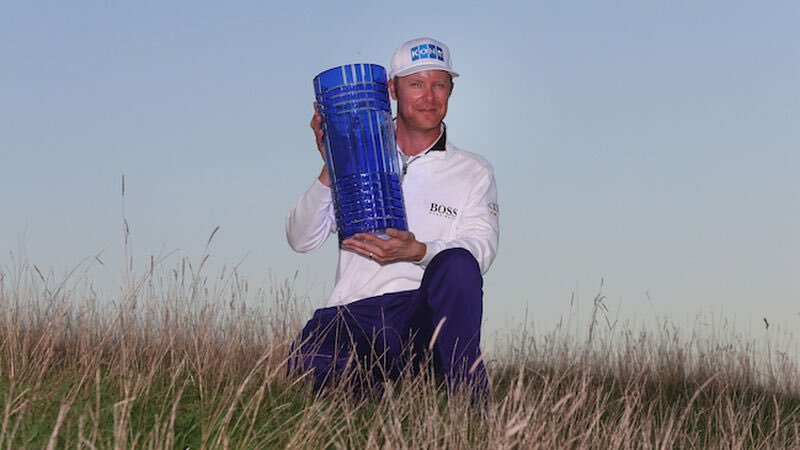 Having worked his way to the top echelon in 2010 with wins at the Scottish Open and a memorable win at Gleneagles, he struggled hugely with injury and the resulting loss-of-form, falling from 18th to almost outside the top-1000 in the OWGR. Indeed, his next win, at the Trophee Hassan some seven years later was completely out of the blue, yet again confirmed that he is totally at home in windy, undulating conditions but also how tough he is in the battle down the back-nine. Putting in decent rounds has been disguised by much lesser scores but he commented just before Abu Dhabi that his hard work was paying off and he feels results are round the corner. Of course he missed the cut that week before showing better in Dubai, where he lay 27th after the third round but a poor short game cost him dear by wages time. However, stats from Oman were dramatically improved in all respects and it is hoped that was the sign he was coming to his best in favourable conditions, something that will certainly be good enough to compete this week. His overall record on windy links is one that screams he will soon forget poor course form, perhaps one that can be ignored since that 24th in 2010, the year he ‘short-gamed’ the lights out to make the Ryder Cup. Rather like last week’s preview, there are a good 8-10 players that can be suggested and if we take the performances of Chris Wood and Bubba Watson as a guide, player’s recent form can often be ignored if they turn up at a track that suits. The crows scream ‘Noooo’ as Chris Hanson gets one last chance to prove the 6th in Dubai was no fluke amongst a trio of weekends off. As stated last week ,’given his best form is at the likes of Morocco (T5/T6), the KLM (T8), Turkey (T7) and at Foshan (T6) it was surprising that he finished so well to nab a top-10 in Dubai with a final round 65. With new driver in the bag it looked as if he was going on one of his streaks…’ Well, it IS a streak but not quite the consistent top-10 finishes expected of such a consistent greens finder and he is certainly hopeful following a ‘good day of practise’. As always, price matters and 125-150 is too big for a player with a top-20 here on his only previous start. I wanted to stick with the usual four selections but can’t decide between two and therefore the final selections are confirmed links specialist Joakim Lagergren and improving bomber Tapio Pulkkanen, last season’s Challenge Tour number one. The huge-hitting Finn took his time flitting between the minor tours but gave notice when winning five events on the 2015 Nordic League. Quiet for the following season, he stormed to form winning in Kakakhstan (Van Rooyen 4th, proven wind players Orrin, Farr and Kinhault behind) and recording six further top-10 finishes. Whilst his profile suggests he needs a year or so experience each time he steps up, that 23rd last week was very eye-catching given he lay 97th after the opening round. Conditions will be similar this week with perhaps his driving a slightly more advantageous attribute around here and last year Wang showed that you can win on debut. Lagergren has links written all over him, his best results of 2017 being 12th at the Dunhill Links, T9 at the KLM and, of course, a play-off loss here last year. With his sole professional win being in Northern Ireland (why do Swedes do so well there, and vice-versa?) we know these are premium conditions so despite the last three missed-cuts I’ll work on the ‘Wood-where did he come from?’ theory. Over at the Honda things look clearer. First up by a long way is Sony Hawaii winner Patton Kizzire. I have been waiting a few weeks to back this two-time winner and this seems perfect. Both Mark Wilson and Russell Henley have won in Waialae and at PGA National whilst the former has also won the OHL- a handful of players also place at both. to think he can leave moderate course efforts behind. Players will need to drive with thought and having won the OHL at Mayakoba, we know he can scramble and play the par-4 holes with aplomb. Whilst a tad spurious, he followed his win in Mexico with 15/45 and has since followed the win in Hawaii with two similar efforts – biorythms? Whilst very difficult to win with, Ryan Palmer can be forgiven a horrendous 2017 through personal and family problems and is far better judged on this year’s 20th at La Quinta and subsequent runner-up at the Farmers. If he is on the way back to the top-75 or so in the rankings, this event will surely contribute to the points and it does no harm to see his victory at Waialae sit alongside a runner-up here to Henley in 2014. Given Palmer has form at the Pheonix, the missed-cut doesn’t look great but rounds of 71/72 are never poor and I still believe there is plenty to work from. The one thing we know about Brian Harman is he will find greens. Seemingly never out of the top-10 in that particular stat, his missed-cut at the Farmers stopped an impressive run of five top-10s and a top-20, his claims boosted further with that 4th at the Sony (opened 65/68). With solid rather than spectacular form here, he still boasts finishes of 11th and 12th, including a round of 61 in 2012, 64 in 2015 and 67/69 when fading to finish 48th last year. The runner-up at last year’s US Open has clearly given him new belief and whilst he has another hard to win with, a top placing is certainly on the cards. Daniel Berger has a similar profile to Harman but the same can be said of Kisner and Dufner – so many ball-strikers that come to the fore when bombing is taking out of the equation. However, the final vote goes to Tom Hoge. Catching the eye when leading the Sony through 16 holes of the final round, he hasn’t confirmed that form quite yet, whilst still not disgracing himself. Backed at Pebble, he never showed despite a 68 third-round at Monterey whilst he started with a 68 at Riviera before fading to 53rd. Sure, he is never going to be lump-on material but given his form in windy conditions and his clear liking for the greens, he is worth a chance a big price to improve enough on a sole finish of 37th.